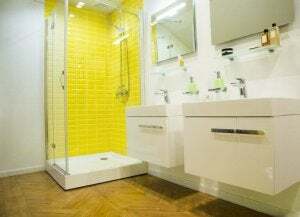 Home » Bathroom » Decorate Your Bathroom With the Color Yellow! 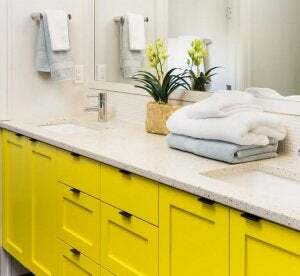 Yellow is a great choice of color for your bathroom--it will make the space feel brighter, warmer, and more unique. Want to give your bathroom a bold color that will make it stand out? You might have a tendency to use the same colors throughout the rooms of your house to avoid mismatching, but why not give your bathroom an original touch with the color yellow? Yellow is in the family of warm colors, but it’s got something that others like red and orange don’t have. It’s more direct and energetic, and more innovative when it comes to home decor. 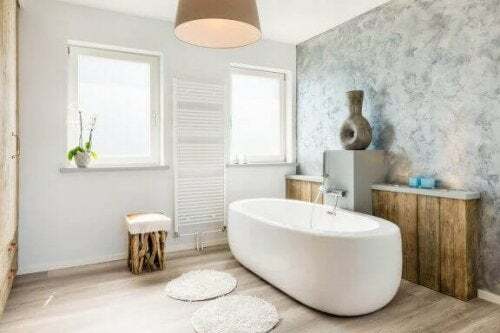 When you think of bathroom decoration, you probably think of colors like blue, grey, white, or earth tones, but you can use just about any color in the bathroom. Yellow is one of the least common, but you can use it to make your bathroom truly visually striking. What does the color yellow do for decoration? On an aesthetic level, it’s a risky color because it might be too loud or not go well with the bathroom furniture. This is what makes it especially important to know how to use yellow and what parts of the bathroom it works best in. Some people like this color a lot and put it in other rooms, like the bedroom, but this is not very common. You want yellow to be in parts of the house you spend less time in. 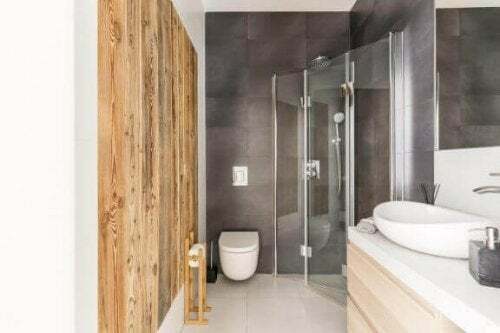 Bathrooms are perfect – you’re in them often, but not for very long. There are also all kinds of different feelings the color yellow can generate. For example, it can convey a sense of strength, intensity, awakening, and just make a great visual impact. Since it’s a relatively loud color, it’s best to combine it with another that can soften the overall environment. Using yellow in your bathroom is a great way to change things up and add a bold decorative touch. 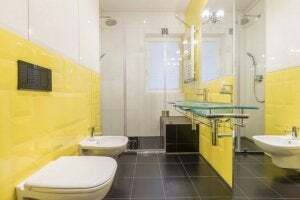 Since bathrooms are generally small, and a lot of the space is taken up by the shower, toilet, and other furniture, it’s best to use yellow for the walls. There are lots of different textures you can try out, and it can go on any part of the wall. Remember: white is your combines well when decorating with yellow. Walls are the best place to incorporate yellow. Like we just said, adding some white is a great way to keep the room from feeling saturated or too intense. It keeps the overall environment much more relaxed. It’s a bit more unusual, but you can also use yellow furniture. You’re not as likely to find this kind of thing at a furniture store, but don’t hesitate if you spot something you like. Paint your walls white to go with the toilet, sink, and shower (if they’re porcelain) and you’ll have a great-looking bathroom. If you want something even more original, you can also use yellow on the floors. This is a great way to draw attention. Any decor involving yellow will catch your guests’ eyes because your bathroom will be so different. In one way or another, you’ll need to have yellow on the walls. If you truly want your bathroom to shine, having it on the walls will give all the brightness you need. There are big and small tiles on the market that you can get in yellow for the entire wall, or for smaller areas, like above the sink. If you’re going to paint, you can paint the entire wall without using any other colors. Nothing but yellow. If you don’t want too much yellow, you can also use it in a more subtle way. This will still add a great touch to the room. For example, you could get a yellow tub. This is a very original, unique choice, and it will make your bathroom visually appealing and warm. You can also go even smaller and only use accessories like the trash can, towels, robes, and curtains. 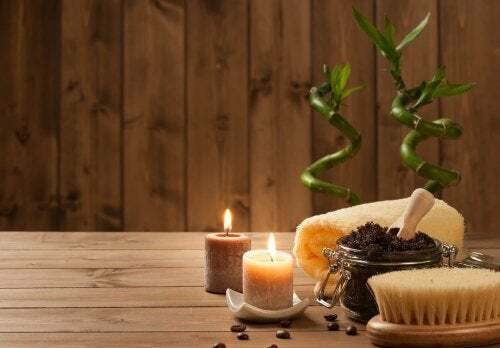 In other words, not everything in your bathroom has to be yellow, just these few small items.